Johnston, C. Fred. "Dugout Canoe". The Canadian Encyclopedia, 10 April 2019, Historica Canada. https://www.thecanadianencyclopedia.ca/en/article/dugout-canoe. Accessed 23 April 2019. Some Haida canoes could hold up to 40 people (artwork by Gordon Miller). 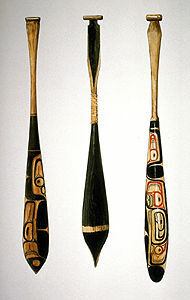 Left to right: Kwakwaka'wakw (Kwakiutl), Nuu-chah-nulth (Nootka) and Haida. Dugouts used by Indigenous peoples were constructed from softwoods, such as cedar, basswood and balsam, using controlled burning techniques and bone and stone chipping tools. Settlers using iron tools created smoothly crafted dugouts prior to the advent of the plank-built canoe. The dugout canoe reached its zenith of construction along the West Coast, where waters teeming with sea life — whales, seals, sea lions, salmon, halibut, herring, eulachon and shellfish — sustained a complex maritime culture. Although there was considerable variation in size and shape of West Coast dugouts, two basic designs dominated the large, 10 to 15 m sea-going canoes. The Northern style used by Tlingit, Tsimshian, Nuxalk (Bella Coola) and Kwakwaka'wakw was perfected by the Haida of Haida Gwaii. It had a rounded hull, flaring sides and a strong sheer along the gunwales rising to high stem and stern projections. The extended prow culminated in a near vertical cutwater. The intrepid Haida seamen dominated coastal trade and their canoe was the most prized object of trade with the mainland First Nations. A Southern or Chinook canoe form was dictated by the Nuu-chah-nulth of western Vancouver Island. Their canoe, much in demand by Salish and Makah peoples on the mainland, was V-shaped with flared-out sides and a low, vertical stem post with a small capped platform. There was a graceful arc to the sheerline as it approached the bow, culminating in a projecting prow which resembled a deer or doglike snout. These massive ocean canoes, designed for trade, whaling and sealing, were mistakenly referred to as "war canoes" by settlers. Early maritime explorers did record their observation of authentic war canoes, up to 24 m long, with the tell-tale protective prow which was both high and wide to shield the paddlers from enemy missiles. Such craft were quite rare by the 1860s. The gigantic red cedar was the preferred wood used by the highly esteemed canoe builders. Drift logs were desirable but, if unavailable, trees were felled using a stone maul with bone, antler or stone chisels and controlled burning. Hand adzes were used to shape the exterior form, followed by hollowing out of the interior. Hot water was used to render the canoe pliable; wooden spreaders were then inserted between the gunwales to extend the beam of the canoe beyond the natural width of the log. High end pieces were carved separately and attached to the bow or stern using a sewing technique. 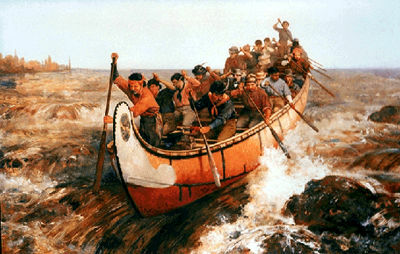 Canoes were colourfully decorated with animal designs using red ochre, black char and assorted animal teeth and shells. Propulsion was achieved using leaf-shaped or lanceolated single-blade paddles and square cedar mat sails. West Coast dugouts all but disappeared with the advent of 20th century power boats. A specialized, Nuu-chah-nulth-style dugout is still used by West Coast Indigenous peoples for canoe racing.